Two U.S. Environmental Protection Agency drinking-water standards for public supplies involving groundwater contaminants that may derive from bedrock sources were promulgated between 2003 and 2006. A new arsenic drinking-water standard, a maximum contaminant level (MCL) of 10 micrograms per liter, became effective in January 2006. The non-radon radionuclides final standard took effect in December 2003, with an MCL for uranium of 30 micrograms per liter. 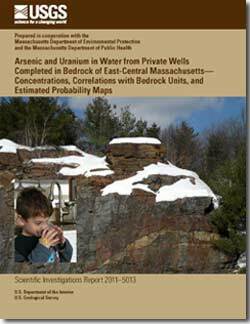 This investigation, conducted in cooperation with the Massachusetts Department of Environmental Protection and the Massachusetts Department of Public Health, assessed the concentration ranges of arsenic and uranium in bedrock wells with reference to the new concentration standards, and associations of arsenic and uranium with bedrock units of the wells of east-central Massachusetts. The investigation focused on east-central Massachusetts, because State public bedrock-well databases indicate that arsenic concentrations in bedrock well water are elevated in that area. The project exploited the wide areal coverage of private wells to give the first detailed look at concentration distributions of arsenic and uranium through the high-arsenic zone of Massachusetts. The results establish statistical probabilities for elevated concentrations by bedrock unit at the scale of the State geologic map (1:250,000), which can guide future well-water testing, treatment, and supply development. Well sampling was from 478 randomly selected wells by private-well users who were sent sampling-kit bottles with instructions and a water-use questionnaire. Results indicated that 13 percent of the randomly selected wells contained water with concentrations greater than the drinking-water standard established for public wells for arsenic, and 3.5 percent were greater than the standard for uranium. Arsenic and uranium did not in general co-occur in water of a given well. Of the wells with concentrations exceeding the standards, the questionnaire results indicated that 66 percent were being used for drinking water without treatment for arsenic, and 93 percent were being used without treatment for uranium. Statistical analysis of the results indicated that distributions of arsenic and uranium concentrations grouped by bedrock unit were log normal. Statistically significant differences were found among distributions by bedrock unit for both arsenic and uranium. However, a zone of elevated concentrations of arsenic was found in groundwater west of the Clinton-Newbury fault (a boundary between two geologic terranes), where correlation between arsenic concentrations and the bedrock units was not significant. Increased sampling in the investigation was directed in the regions of three 1:24,000 (7.5-minute) quadrangles where recent detailed geologic mapping had been conducted. Improved correlations of arsenic and uranium with bedrock unit were measured for two of the three quadrangles compared to the correlations made for the statewide map. Cumulative distribution frequencies of concentrations grouped by rock unit or area (zone of elevated arsenic concentration) were used to assess the probability of wells having concentrations exceeding the drinking-water standards. The probabilities were mapped and applied to the estimated number of private wells in the study area to determine the likely number of wells in the study area with concentrations exceeding the standards. For arsenic and uranium, respectively, about 5,700 and 3,300 wells were estimated to contain concentrations exceeding the standards. Estimates for arsenic may approach the total number for the State, because the study area covered the principal known area of elevated arsenic concentrations. Colman, J.A., 2011, Arsenic and uranium in water from private wells completed in bedrock of east-central Massachusetts—Concentrations, correlations with bedrock units, and estimated probability maps: U.S. Geological Survey Scientific Investigations Report 2011–5013, 113 p.